Historically, Apple’s App Store has always generated a lot more revenue compared to the Google Play store. The App Store continues to maintain that lead, and in the third quarter of 2018, that gap widened to the widest point yet. According to a new report from Sensor Tower, the App Store earned nearly 93% more than Google Play in the quarter, the largest gap since at least 2014. 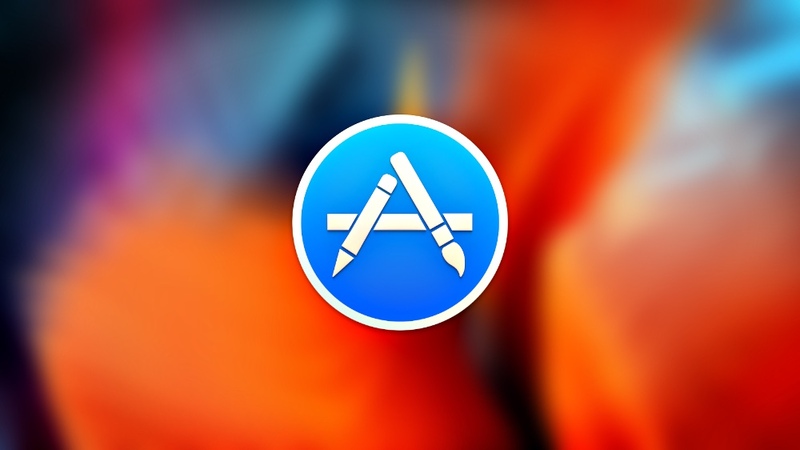 The firm says that approximately 66% of the $18.2 billion in mobile app revenue generated in Q3 2018 came from Apple’s App Store. The store made $12 billion in the quarter, up 23.3% from the $9.7 billion it made during the same period last year. Meanwhile, Google Play earned $6.2 billion in the quarter, up 21.5% from the year-ago quarter’s $5.1 billion. Subscription-based apps are the backbone of the app economy on both platforms. Netflix remained the top-grossing non-game app for the third quarter in a row, bringing in an estimated $243.7 million across both platforms. 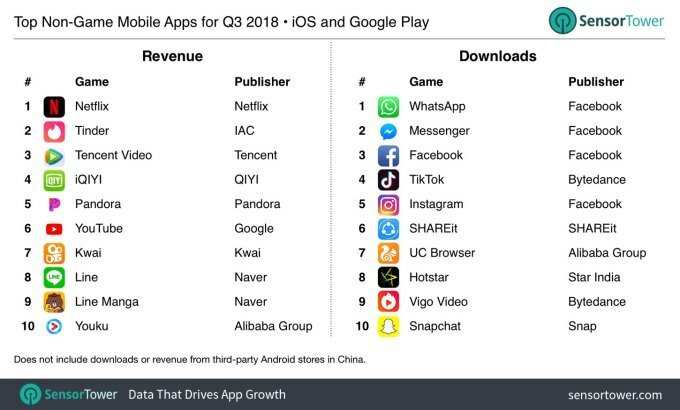 Tinder and Tencent Video are in the second and third spots, respectively. As expected, mobile game spending helped fuel the revenue growth a lot. Spending went up by 14.9% year-over-year during the quarter to reach $13.8 billion. 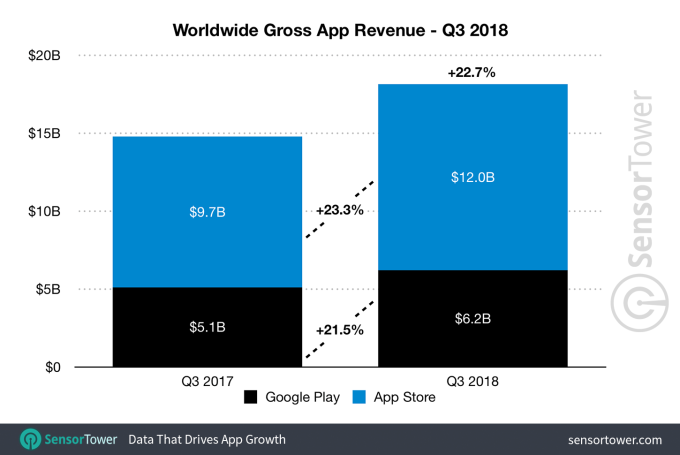 It has accounted for 76% of all app revenue across both platforms in the quarter, with $8.5 billion coming from the App Store and $5.3 billion from Google Play. 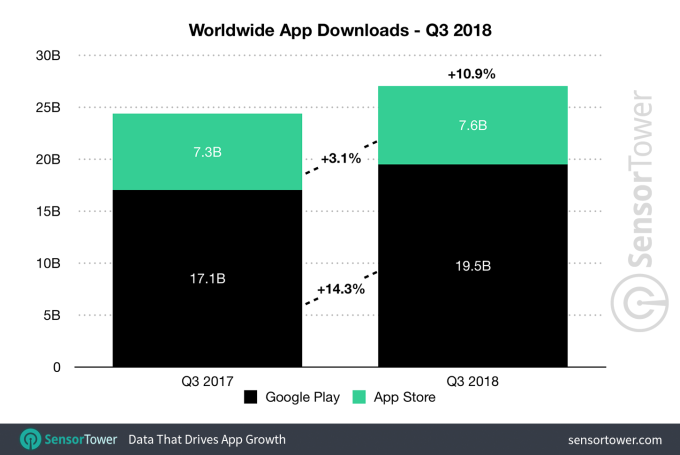 Google Play still reigns supreme when it comes to the total number of apps downloaded, as it is distributed on a wide variety of devices, especially the lower-cost ones in emerging markets. App installs grew 10.9% across both stores, reaching 27.1 billion, up 24.4% from Q3 2017. After Musically’s untimely demise, TikTok became the fourth most downloaded app in Q3, sitting beneath Facebook, Whatsapp and Messenger. It has grown 15% over last quarter and 440% over the last year. TikTok is ahead of Instagram (No. 5) and Snapchat (No. 10), which may come as a shock to many. You can read the full report here. Things are unlikely to change in the next quarter. At best, the Play Store can reduce the revenue gap by a little, but overtaking the App Store seems nigh impossible at this point.